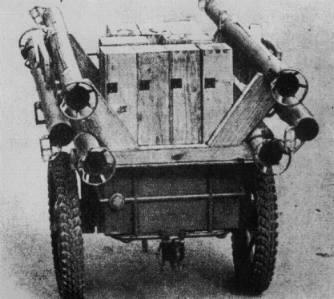 The unexpected advent of the M1 Bazooka in Tunisa made a considerable impact on the German military establishment.Not only did the Bazooka concept present a considerable danger to German armor but the simplicity , low cost and potential of the launchers design made a great impression.The immediate result was the abandonment of the R-Werfer 43 in favour of the novel Bazooka rocket delivery system.Within weeks the first examples of the 88mm (3.4in) Raketenpanzerbüchse43 (88mm RPzB 43) were coming off the HASAG production line at Meuselwitz.Most R-Werfer 43's already produced were sent to Tunisia or Italy and were soon forgotten or lost in action.A few were diverted to be emplaced among the defensive works covering the Normandy beaches as part of the Atlantic Wall defences. 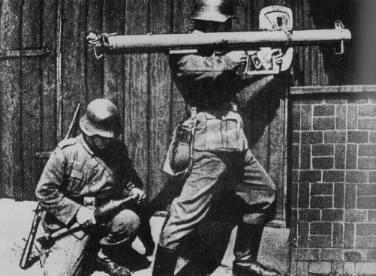 The RPzB 43 Panzerschreck (Tank Terror) was an enlarged version of the M1 Bazooka being scarcely more then a length of steel tube with a shoulder rest and firing arrangements attached , hence the alternative German nickname of Ofenrohr (Stovepipe).The calibre was selected simply because 88mm hollow charge warheads were already in production for launching from the R-Werfer 43 but with rockets for the RPzB 43 there was a difference .Having noted that the American M6 HEAT rocket was ignition method was altered accordingly , resulting in the RPzBGr 4322 weighing 3.25kg (7.2lb).However the Germans decided not to adopt the battery-powered ignition circuitry rapidly developing and adopting a magneto-driven ignition method.It is interesting to note that the Americans later adopted a magneto ignition system for their M9/M9A1 launchers. Various firing positions were also used for the RPzB 54.The safest manner was the laying position.The gunner and loader had to lie at a right angle to the weapon. The kneeling and standing positions were used only from cover. "see above"
The weight of a loaded 88mm RPzB 43 was 9.5kg (20.9lb).Armour penetration performance remained as before ie 160mm (6.24in) of armour plate set at an angle of 60°.The length of the RPzB 43 (1.64m) meant that to handle it effectively called for a team of two , one acting as the loader and carrying five ready-use rockets on a special backpack frame.Only when a target approached was a rocket loaded into the rear of the launching tube where it was held by a retaining catch and connected by the loader to the firing circuit via two thin wires.The firer used simple fixed sights for aiming and cocked the firing arrangements by pulling back a spring-loaded lever. Operating the trigger produced a current for a primer to ignite the rocket motor and launch the rocket. RPzB 43 teams had to be masters of concealment and stealth for the practical range of the RPzBGr 4322 rocket was a maximum of 150m (492ft).Combat ranges were frequently considerable less.A trained team could launch four or five rockets in one minute.Panzerschreck warheads were also highly effective against field fortifications or buildings during fighting in built up areas. The RPzB 43 was very rapidly accepted into service and soon became the preferred portable anti-tank weapon for infantry formations.By 1944 the weapon was so well integrated that each infantry regiment had an establishment of 36 held by the regimental anti-tank company , along with three 75mm (2.9in) Pak 40 towed anti-tank guns.The so-called Volksgrenadier infantry regiments of the latter war years were meant to have a planned 72 Panzerschrecken. An If.8 infantry cart used to transport six Panzerschreck and along with a second wagon the thirty rounds of ammunition for a tank-destroyer group. By mid-1944 the RPzB 43 was well into the process of being withdrawn from front line units in favour of the improved 88mm (3.4in) RPzB 54 , the RPzB 43s were transferred to second line and home defence militias.The main change on the RPzB 54 was the introduction of a shield for the firer plus the weight increased to 11kg (24.2lb).By 1944 the Panzerschreck series had already become so important that production was in progress in seven centers and many others were concerned with sub assemblies.The simplicity of the RPzB 54 and its lack of demand for critical raw materials or manufacturing resources was such that the unit cost was only RM70.Production totals during 1943 and 1944 reached 289,151. By the end of 1944 production was already switching to the 88mm (3.4in) RPzB 54/1 capable of launching an improved rocket , the RPzBGr 4992.While the armour penetrating warhead remained as before the RPzBGr 4992 was modified by having a far more efficient motor which completely consumed its propellant by the time it left the muzzle.The exhaust hazard to the firer therefore no longer existed , except under extremely low temperature conditions although the safety area to the rear still had to be observed. The improved RPzBGr 4992 motor also increased the maximum range to 180m (600ft) while at the same time allowing the overall length of the launch tube to be reduced from the former 1.64m (5ft 5in) to a handier 1.3m (5ft 0.25in) , the weight reverted to 9.5kg (20.9lb).RPzB 54/1 production had reached 25,744 by the time the war ended.By then 2,218,400 88mm RPzBGr 4322 and 4992 rockets had also been manufactured.